Natural soaps enriched with the energetic flow of precious "officinali" pharmaceutical herbs that intensify the therapeutic benefits of bathing. Medicinal plants such as sage, thyme, rosemary, mallow, lemon balm, fennel, and dandelion are used. Each soap is wrapped in paper with beautiful floral illustrations, enriched with an attractive and refined ribbon on the top and produced with an entirely artistic process, as in the best Italian soapmaking tradition. 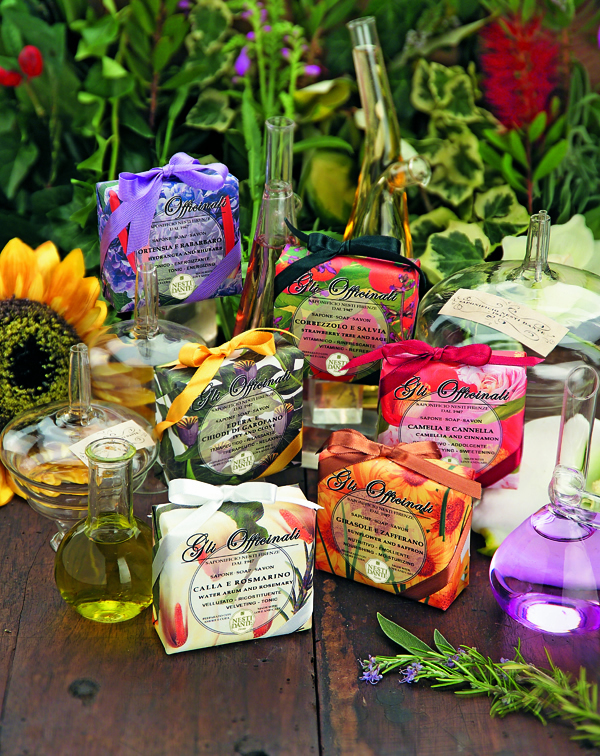 An elegant collection of six energetic, precious and natural pharmaceutical herb soaps that intensify the therapeutic benefit of bathing. In the 15th century a vast pharmaceutical literature flourished in Italy, consisting of books and pharmacopoeia: its maximum expression is the Ricettario Mediceo Fiorentino (the Medicean Florentine Prescription Book), which originated a noble profession called L’Arte dei Medici e degli Speziali (the Art of Physicians and Apothecaries). The Art of Physicians and Apothecaries made use of Medicinal plants such as sage, thyme, rosemary, mallow, lemon balm, fennel and dandelion, still widely employed. Rosemary, displayed ever since antiquity at weddings, as a symbol of immortality and fidelity. The sensual perfume of Calla Lily enhances its beneficial invigorating effects. mixing them with the revitalizing olfactory notes of Hydrangea. Cloves, combined with the regenerating essence of Ivy, have a rapid relaxing action. Sage, aromatized with fruit of the Strawberry bush, offers a prolonged sensation of freshness. supported by Sunflower to offer nourishing and emollient properties.